Resident Evil: Retribution is the fifth film in the W.S Anderson Resident Evil saga. It seems the new one out next year shall be the last in the series. Originally released in 3D though I saw the DVD version of this. 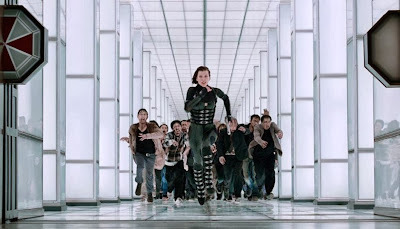 After an awesome intro that ties up the cliff hanger of Afterlife we find Alice (Milla Jovovich) a prisoner of Umbrella some unknown time later. She is being routinely tortured and interrogated by Jill Valentine who is under mind control by the evil corporation. A systems shut down occurs in which Alice is able to escape her cell. She soon comes into contact with Ada Wong; a known Umbrella spy who reveals she now works for Wesker (Shawn Roberts reprising his role from Afterlife) who has now defected. He appears on a video screen to tell Alice that the base is under the control of an A.I; Red Queen, the very same one that was out for her blood in the very first film, and that a team of specialists are at that very moment breaking into the remote Russian base to free her. Along the way she finds a young girl who mistakes her for her mother (for reasons). Retribution starts off with action and never lets up, it gets to be quite exhausting with the almost zero amount of down time. The thing that drew me most to this was the return of numerous characters from all of the previous films. From the first one you have the very hot Rain (Michelle Rodriquez) and One. From Apocalypse Carlos and Jill appear, while from Afterlife the character Luther West. It can be quite dizzying at times the amount of new and old characters who come and go, all handily explained with the excuse of the facility Alice had been held in partly being a clone factory. 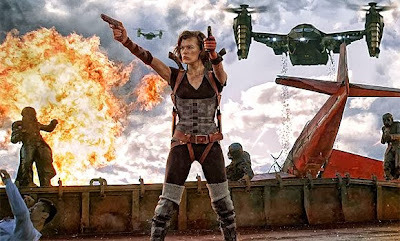 It was really fun to see Jill (wearing her Resident Evil 5 catsuit), Carlos and Rain all on the bad guys side now (and on the good side also, as I said; clones). Leon Kennedy and Barry Burton from the games appear but this just adds to the crowded cast of characters. Ada Wong is the best voiced though as Bingbing Li who plays her has her voice dubbed by the voice actor from the games! Also adding to the noise is the fact that the place Alice is held at was also used for demonstrational purposes to show the effects of the T-Virus to potential customers. Huge life like habitats have been made that mirror central New York, suburban America, Moscow, Japan (the location from Afterlife's intro) and China, though that last one is not actually shown. Populating these simulations are the clones who have been given false memories to help accurately simulate an outbreak A dream sequence Alice has of being a suburban housewife heavily mirrors the start of the Dawn of the Dead remake, very heavily but is awesome. In each of the zones entered the watching Red Queen starts up a simulation to try and kill the intruders and escapees. Zombies now run, they charge headlong and are of the Las Plagas variety with tentacles coming out their mouths, universally run but there are so many that it is awesome. A great early fight sequence has Alice battling a literal horde of undead via a bike chain and pistol. Moscow has Soviet zombies armed with guns and vehicles, these also look awesome and are quite fearsome, creating a fun chase sequence. As the giant with the massive axe was so popular in Afterlife there are now two chucked into the mix and while there are no zombie dogs for once, there is instead a elephant sized Licker that constantly harasses the group. In the end it is the human enemies who have the most screen time, a never ending final duel fight sequence is very well choreographed and mostly fun as all hell to see and has a great and stylishly shot finish to it. The main problem with Retribution is that it is all style over substance. It all looks great, the CGI effects while still dodgy at times are so much better with each installment. It is a real roller coaster though which becomes a bad thing. It is like a LSD induced fever dream, a manic desire to cram as many characters from the game as possible leading to the feeling that it is almost just fan fiction. The plot is very basic and not that exciting, compared to the scope of the others this feels like a side story, like a straight to DVD film much like the Japanese CGI Resident Evils are. As a geek I have to say someone injecting the Las Plagas virus into them self should mutate into a monster, not just become invincible as happens here! Now I am very tired and this is not the most condensed review I have ever done so I will end here. To sum up; Retribution looks fantastic, very stylish and features some fantastic action sequences as well as fun nods to the videogames, yet the horror element the series so struggles to hold onto has mostly been lost once more.